Went with two friends to a Burger King food tasting session at Novena Square quite some time ago and had truly enjoyed ourselves there. However, was kind of sad when we were presented with coupons for redemption of complimentary whooper meal. Both my friends and myself do not consume beef . In the end, the vouchers were passed to other friend. Before leaving, we mentioned our concerns about the voucher to one of the staff who took down some notes and promised to look into the matter. I did not think much about it at that time. But Burger King gave me a very big surprise when they emailed me less that 2 days later, asking for my mailing address to send me some replacement vouchers. That is so sweet of them. The mail containing three replacement vouchers from the King arriving in my mailbox. I’m so grateful. The King had not turn a deaf ear to the cries of his royal subjects. Long lived the King! My Pathetic Cup Of Sundae… Sob!!! Sob!!! Went with a friend to Burger King @ Vivo City for our daily dose of sundae and was very shock by the amount given to us. It completely left us both speechless. We simply couldn’t believe our eyes. We’ve both been to many other different Burger King outlets, but this is the first time we’ve got sundae of such low volume. The store was not crowded during our visit , with only 3 other customers in front of us. My King has failed me… Am considering staying away from this outlet. The King has decided to pamper his royal subjects with yet another round of free treat. Starting from 11th Apr till 27th Apr 2011, simply present the above coupon or flash it on your mobile/electronic devices prior to ordering, to enjoy a complimentary sundae (chocolate or strawberry or caramel) with every burger (A la carte or meal) purchase. The King wishes his royal subject bon apettit! 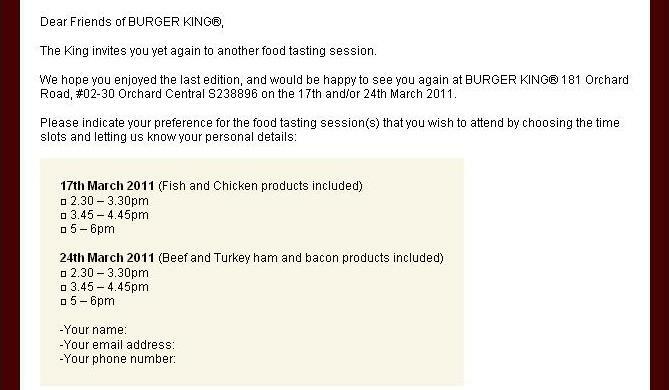 I received an email from Burger King, inviting me to yet another of their food testing session. How can I ever miss such wonderful session. Do please hurry as spaces are limited. And do also take note that the session on 24th March includes beef and turkey origins. Do highlight in your email to the King so that you have a higher chance of being selected for the first session on 17th March, which only includes fish and chicken origins.